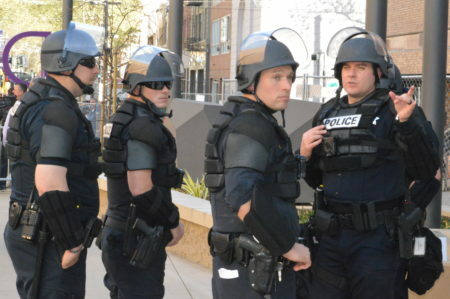 Sacramento police officers patrolling Golden 1 Center on March 29 to prevent Stephon Clark protesters from shutting down a Sacramento Kings game for the third time in eight days (OBSERVER photo by Antonio R. Harvey). SACRAMENTO — When Sacramento City Councilman Larry Carr was a member of the Sacramento Municipal Utility District’s Board of Directors, he was known as a person who could analyze problems and then fix them with the right solutions. Carr had never been one to sugar coat important topics that involved SMUD employees, contractors, or customers. Since he’s been the representative for Sacramento City Council District 8 for nearly four years, his way of addressing issues is still the same. Since the police-involved shooting death of Stephon Clark in his grandmother’s back yard on March 18 Carr is intent on trying to eliminate such type of police actions that have resulted in the death of mostly African American males. Clark was shot at at least 20 times by two officers, struck by eight bullets, six of which hit him in the back, it was discovered in an independent autopsy performed for the family. It’s a case that many in the community feel was avoidable. Carr feels the same way. Carr is still waiting on “more facts” to come out in the investigation conducted by the Sacramento Police Department. But his willingness to change policy within the department stems from body camera videos that captured the activity in the Clark shooting. It was too much for his eyes to bare, he says. Credit goes to the City Council which demands that any videos available in officer-involved shootings be released with 30 days. Police Chief Daniel Hahn released moving images of the Clark shooting within 72 hours. That’s accountability, Carr says. The previous administration before Hahn was trying its best to hold off releasing the Joseph Mann videos to the public up to 90 days. During a City Council meeting, Carr told then interim Police Chief Brian Louie that was not going to happen and most of the member of the the city council agreed. Carr wants to create a policy that would allow police officers to “use a minimal amount of force necessary” and “warn people before we shoot them,” he said. He also wants the “less lethal” weapons used by an officer. The councilman for District 8 also shared that it may come down to seeing if the police department has an “institutional problem” if any of the officer are not following protocol. The Peace Officers Research Organization of California, PORAC, widely known as the the largest group representing law enforcement in the state, says that AB 931 is deceptive in how it is perceived and is a rush to judgement. The PORAC is not totally against working with legislators in creating a checklist, but wants more input on the language and implementation going forward. Even though Internal Affairs for the Sacramento Police Department, the City’s Office of Public Safety Accountability and the California State Attorney General are conducting an investigation into the shooting of Clark, who was unarmed with a cell phone, Carr still wants an independent examination of the case. Sacramento County District Attorney Anne Marie Schubert will ultimately decide whether or not to file charges against the two police officers involved in the shooting. There is already an uproar from the community about Ms. Schubert’s legitimacy of being fair during the process. Reports have surfaced that she received thousands of dollars after the shooting from police entities in support of her reelection campaign. Chief Hahn requested for the state’s A.G. Xavier Becerra assistance. Carr wants to take it one step further.